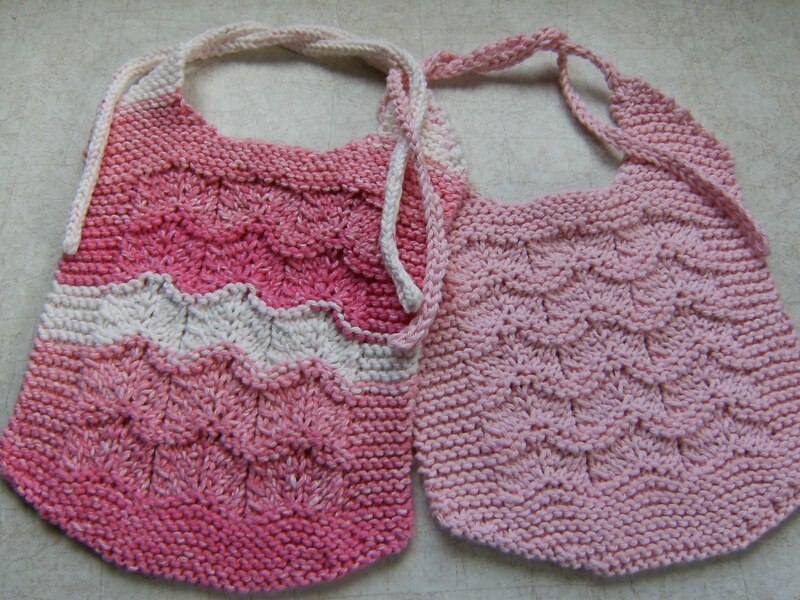 Cloth Size: approximately 7 ½" X 7 ½"
Materials: I love those pretty cotton yarns with the wide stripes made by Sugar’n Cream and I wanted to design a bib specifically for them. I think this pattern works well, however, if you want the shoulders and the ties to match up, then you’ll probably need to have two balls and you will have to sacrifice some yarn to achieve the symmetry. If you’re using a variegated or a solid yarn, then one ball is sufficient. You need about 88 – 100 yards when knit to the suggested gauge. Samples were done in Pinky Stripes and Baby Pink. Gauge: 4.5 sts. per inch. Stitch Markers (optional). Although this is a simple lace pattern, you might want to use markers between the lace repeats to help you keep your place in the pattern. The pattern repeats every 9 stitches between the borders. This pattern allows you to choose between two methods of beginning the bib. One uses short rows and the other, more traditional way, requires you to cast on stitches at the beginning of the first few rows of the pattern. The short row method is really easy and gives you a nice smooth line. There are also two methods for doing the ties. One has crocheted ties and the other method uses knitted I-cords. The crocheted ties are slightly thinner. If you do make the knitted ties, you can drop down a needle size when knitting the cords. I like to run a long tail down the center of the cord to finish it off. Be sure to use a straight needle and not one with a bent tip! Pattern: Cast on 39 sts. Note: To begin this bib with a striped yarn, I recommend that you start by finding the first color change and then cut the yarn at that point so you are starting at the beginning of a color change. Now measure about 30 inches and begin casting on your stitches. I like to use the long tail cast on, but use whatever method you like. I’ve found that by starting at this point, and knitting to gauge, you’ll get the best results. Row 13: knit.Continue in pattern beginning with Row 12 below*. Begin lace pattern: The first and last 6 stitches of every row form the borders. 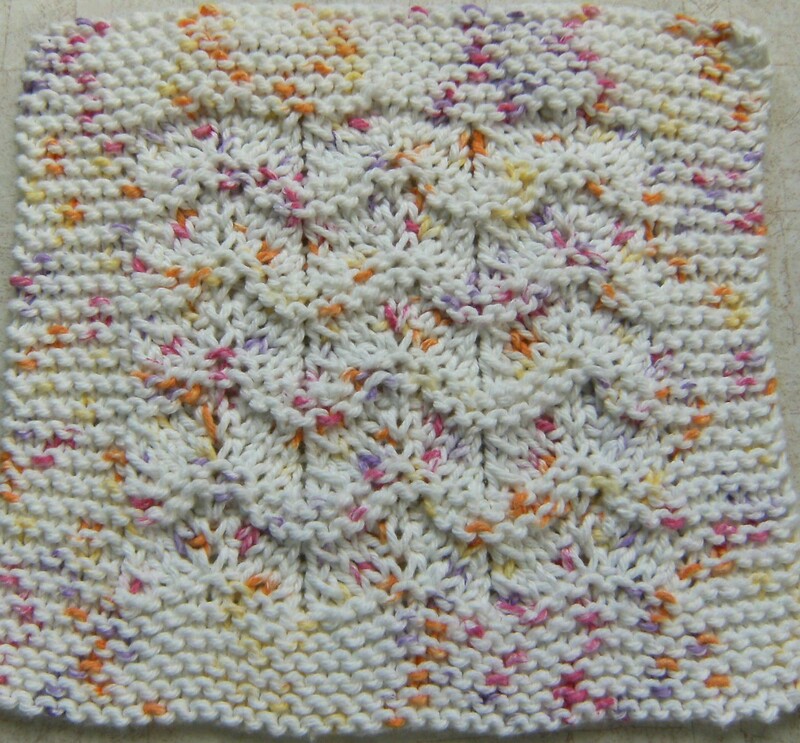 The lace has three repeats each with 9 stitches. Row 13: k6; (k2tog., k1, kfb into the next two stitches; k2; slip 1, k1, psso) x3; k6. Row 14: k6; p27; k6. Row 15: same as 13. Row 16: same as 14. Row 17: same as 13. Repeat Rows: 13 – 20 four times for a total of five repeats. Knit 14 stitches. Slip sts. just worked onto stitch holder, bind off the next 11 stitches knitwise; work across remaining sts. in established pattern: 14 stitches each side. Note: IF you are using the striped cotton, you will now need to calculate where you are in your color sequence so when you knit the right shoulder, it will match (if you want them to match!) Most likely you will have to use the second ball to get it to line up. As you look at the bib with the right side facing, the first shoulder worked will be the left side. All the decreases are made on right side or odd numbered rows. With wrong side facing, slip sts. from stitch holder to left needle and join yarn at neck edge. This is where you need to pay attention to the color sequence to make it match the other shoulder. All the decreases are made on right side or odd numbered rows. Row 1: (wrong side) knit across row. Cast on 39 stitches and knit 10 rows. You’ll have five garter ridges. Row 1: k6; (k2tog., k1, kfb into the next two stitches; k2; slip 1, k1, psso) x3; k6. Row 2: (wrong side) k6; p27; k6. Row 3: same as 1. Row 4: same as 2. Row 5: same as 1. Rows 6 – 8: knit. Repeat Rows: 1 – 8 four times for a total of five repeats. Knit 7 rows. You should have five garter ridges and end with a right side row. Thank you Elaine for yet another adorable bib. I have done one in Baby Stripes and am going to do the cloth and maybe increase the border to make it a pukerag/burpcloth,too. I only had 3 skeins of the Baby Stripes and it took most of one for the bib. I think the yarn's discontinued,so I'm doing the other cloths in pink. Hope to do more in other colors,too. I am almost done with a Burgandy Baby Starfish bib and will then do a matching cloth. Thank you again for the lovely patterns. another great pattern! Many thanks!! Wonderful knitting pattern Elaine. 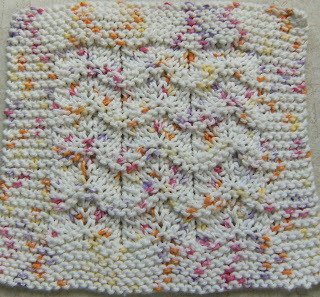 I have added a lint to it on my list of knitting patterns at KnittingPatternDesigns.com. Good morning. I am new to knitting. I am trying to make this bib. I am confused on it after row 13? Can some one please tell me what to do after that.